If Graylee Perez thought sharing a body with her twin sister was bad, dealing with a duplicate of herself is two times worse. Gray the second doesn't seem to get that Lee's boyfriend, Raj, is off limits. Then there's the problem of Adrian. He expects one of the Graylees to be his. Nearly a year later, the council is on to them for past misdeeds; Lee, along with the rest of the coven, has lost control of her powers; and Gray is being stalked by what looks like the Grim Reaper. If the two Grays work together, they may stand a chance of setting things right and making it out alive. Firstly, just wanted to say that I love the cover of this book. It doesn't do much in terms of explaining the story but it is stunning. 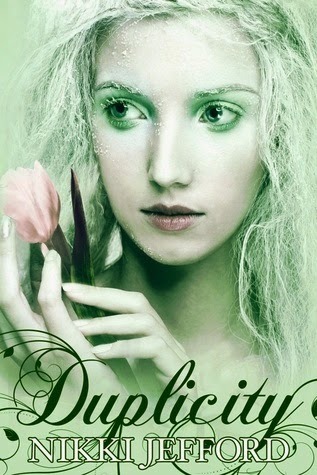 Duplicity, the second book in the Spellbound series was an interesting but slightly confusing read. First Graylee Perez was taken from her body and put into another’s and now there are two Grays, one in Charlene’s body and the other in Stacey Morehouse’s body. It was confusing because I read the first book quite a long time ago so it took me a while to remember what had happened, plus having two Grays in different bodies, one who just came into existence after almost a year from the original ‘switch,’ is enough to confuse anyone! To prevent further confusion I’ll refer to the ‘duplicate’ Graylee that is in Charlene’s body as ‘Gray’ and the original Graylee that is in Stacey’s body, ‘Lee,’ as these are the names used in the book. I pitied Gray, because she’s come back to find that she’s missed out on the last 8 or so months, another Gray has been filling her place, her boyfriend’s moved on with Lee and basically everyone has been fine without her. Not to mention that someone has put a spell on the town which is making everyone’s powers out of control, Gray coming back (again) isn’t exactly big news. The worst thing is that both the girls are Graylee but Gray is seen as the duplicate; the excess version when really they were all doing fine without her. Talk about feeling unwanted! Surprisingly, or perhaps it isn’t that surprising really, Lee and Gray do not get along, to put it lightly. Each thinks the other is the ‘intruder.’ Gray feels that Lee has stolen her life, whereas Lee is feeling threatened by Gray’s return, especially since Gray looks more like the original Graylee Perez. I’m not particularly fond of Raj, he’s too loved up with Lee for my liking, not that it stopped him from kissing Gray because he was ‘confused.’ Ha! Although to be fair it’s not exactly his fault since Gray can’t seem to accept that Raj is Lee’s boyfriend, not hers. Adrian, on the other hand, is far more interesting. Slightly evil, crazy and power hungry, but definitely has more appeal than Raj. I feel that he and Gray may share some interesting chemistry in the next book. Overall, a light and fun albeit confusing read but I recommend reading book one first! She didn’t come up with anything other than what she felt wasZ a reasonable question: if it was okay for doppelgangers to run around, why couldn’t there be two people with the same mind and memories? Who was that bothering, really?